Adaptive capabilities are essential to guarantee the proper execution of Web services and service-oriented applications once dynamic changes are not exceptions but the rule. The importance of adaptive capabilities significantly increases in the context of Future Internet (FI) applications will have to autonomously adapt to changes on service provisioning, availability of things and content, computing resources, and network connectivity. Current solutions for adaptive Web services and adaptive service-based applications will be challenged in such a setting because they fall short to support essential characteristics of FI applications. This chapter analyzes and justifies the need for the transition from adaptive Web services and service-based applications to adaptive FI applications. Based on two real-world use cases from multimedia and logistics, the authors examine where current solutions fall short to properly address the adaptive needs of FI applications. They propose future research challenges that should be considered in adaptive FI applications. Adaptive capabilities are essential to guarantee the proper execution of Web services and service-oriented applications once dynamic changes are not exceptions but the rule. The importance of adaptive capabilities significantly increases in the context of Future Internet (FI) applications. As it will be described in this chapter, applications in this context will have to autonomously adapt to changes on availability of things and content, computing resources, and network connectivity in addition to changes in service provisioning as faced in Service-Oriented Systems. The unprecedented level of heterogeneity and dynamic changes of FI applications will demand a transition from adaptive Web Services and service-oriented systems to adaptive FI applications. Four major pillars constitute the FI: the Internet of Services (IoS, e.g., software services based on third-party services), the Internet of Things (IoT, e.g., smart sensors and devices), the Internet of Content (IoC, e.g., video streams and online games) and the Network of the Future (NoF, e.g., ubiquitous connectivity). These pillars will all converge into an integrated environment (Domingue et al., 2011). It is expected that – to a large extent – FI applications will thus be composed of third-party offerings deployed on federated service delivery platforms through different cloud delivery models, such as Infrastructure as a Service (IaaS), Platform as a Service (PaaS) and Software as a Service (SaaS) (Armbrust et al., 2010). Ultimately, this means that loosely-coupled Internet services will form a comprehensive base for developing value-added applications in an agile way (Metzger & Di Nitto, 2012). This is unlike traditional application development, which uses computing resources and software components under local administrative control. To maintain their quality of service, FI applications therefore need to dynamically and autonomously adapt to an unprecedented level of changes of heterogeneous entities that may occur during runtime. Over the past decade a wealth of technologies for engineering adaptive Web-based services and service-oriented systems has emerged. Those technologies offer significant advancements for what concerns furnishing applications with self-adaptive capabilities. Still, those solutions focus on isolated pillars of the FI. For example, many solutions consider software services (i.e., IoS) but fall short of integrating things (i.e., IoT) yet, the IoT amplifies the level of heterogeneity and changes on available resources and data. 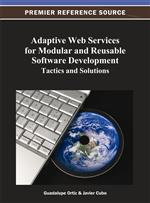 In this chapter, we review trends and current solutions for adaptive Web services and service-oriented applications. Based on real-world use cases from multimedia applications, as well as transport & logistics, we examine the transition from adaptive Web services to adaptive capabilities for FI applications. We demonstrate that FI applications promise full integration and combination of real, physical world services, business objectives and ICT services. This means a shift from considering adaptation only on the ICT level (and business level, as some initiatives already show), i.e., such as service-oriented applications, to extending this concept to unprecedented levels. The first use case explores how adaptation of IoC and IoS should be considered in FI multimedia applications. The second use case demonstrates the importance of combining IoT, IoS, and business objectives for the success of FI transport & logistics applications. Finally, we conclude proposing relevant research challenges that remain to be addressed. In the next two sections we first describe the major facts and topics that are relevant for the purpose of this chapter. We start with the introduction of how research and ideas related to Web-services, service-oriented applications, adaptation and Future Internet evolved over the past years and got connected to each other. After this, we present an overview of technical solutions specifically developed for adaptation of Web services and service-oriented applications. The fourth section presents the use cases and describes their scope and adaptation needs. Then, we discuss the challenges faced in those use cases to advance from adaptive service-oriented applications to adaptive FI applications.